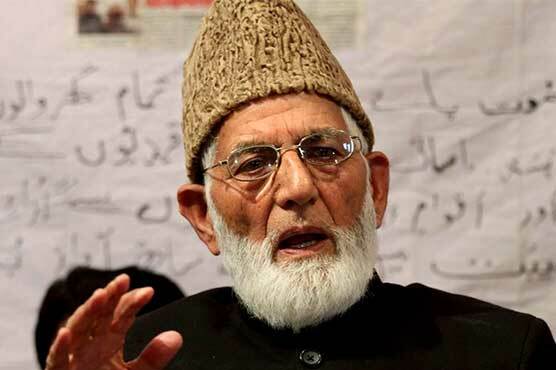 ISLAMABAD, Aug 24 (APP): Hurriyet leadership has unanimously said that the solution to the Kashmir dispute lies only in securing the Kashmiris’ right to self-determination in accordance with the resolutions of the United Nations on Kashmir. According to KMS, the Chairman of All Parties Hurriyet Conference, Syed Ali Gilani, Mirwaiz Umar Farooq, Shabbir Ahmad Shah and other Hurriyet leaders while rejecting the Indian Prime Minister Narendra Modi’s assertions on talks on Kashmir maintained that the universal principle of Right to Self Determination was the only road to peace in Jammu and Kashmir. The Chairman of Jammu and Kashmir Liberation Front, Mohammad Yasin Malik and other Hurriyet leaders in their separate statements denounced the Indian Finance Minister Arun Jaitley’s remarks against Kashmiri protesters. The leaders said that by describing peaceful protesters as attackers, Arun Jaitley had demonstrated the colonial mindset of Indian rulers vis-…-vis Kashmir. Dozens of protesters were injured in pellet firing by Indian armed forces’ personnel on anti-India protest rallies in Shopian, Nowgam, Bandipora, Sopore, Rafiabad, Baramulla, Dapan and other areas of the territory. The protesters waved Pakistani flags and raised anti-India and pro-freedom slogans. Liberation leaders including Sikh leader, Narender Singh addressing thousands of people during a protest rally in Badgam urged the international community to stop India from committing violence in Kashmir. An official residence of an Indian army-backed Ikhwan’s member was attacked in Bandipora. In another development, two Special Police Officers publicly resigned from the police jobs in Sopore and announced to join the Intifada in Kashmir.